The true principles of success are not new. Most of the ideas in this book and the many others that fill the self-help shelves of bookstores have been around for decades and even centuries. 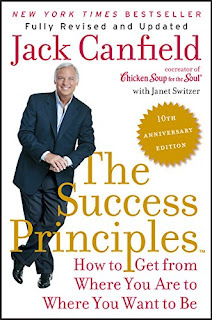 What Jack Canfield has done, going all the way back to his first Chicken Soup for the Soul book, which spawned a franchise that has sold over half a billion books, is to bring these ideas together in meaningful ways. His books act as portals, to use a web analogy, collecting and presenting the ideas of others. Many of the principles that are given a single-chapter treatment in this updated version are detailed and broadened in separate books, such as Jack Canfield's Key to Living the Law of Attraction: A Simple Guide to Creating the Life of Your Dreams. But in The Success Principles, he gives a description of all of the principles in one volume. It is like an encyclopedia of success concepts, with sixty-seven entries. That sounds like a lot and it is. This is a thick, five-hundred-page book and it is all about success. So it is a bit difficult to take all at once. Although I read the entire book, I had to take breaks and read other things as my interest waned from time to time. That is not to say it isn't well-written. Far from it. I was motivated and inspired by the text. But this is more of a reference work than an inspirational monograph. I look forward to revisiting chapters, looking up referenced books and websites, returning to it for smaller bites of useful instruction and self-improvement tips from time to time. The Success Principles covers the gamut of areas for personal improvement: financial, occupational, physical, psychological. There is a spiritual aspect to it, but one that is not tied to any religious tradition. I think this book belongs on the shelf of anyone who is serious about doing real work to achieve his or her goals.